season. The team won the season opener against the Dallas Mavericks, 101-100. The Championship ring contains more than three ounces of 14 carat white gold with 5.09 total carat weight of diamonds. The top includes 76 round, 10 princess cut, and four baguette diamonds. Around the edge of the top are 42 round diamonds. The left side of the ring showcases the player’s name and number. The right side of the ring showcases the Spurs “Pounding the Rock” symbol containing 22 round diamonds. There are five sparks shooting out from the rock which contain the number of diamonds that coincide with the number of championships an individual player is associated with. 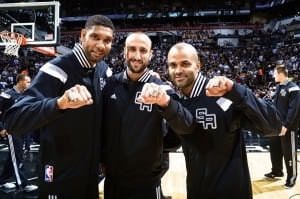 They were good the year before, but last year the Spurs were great.